Some amusement and some downers. Over the last couple of weeks, Tika has had a harder and harder time getting to her feet, particularly on slippery floors. And has been giving me a "you can't really mean that" look when she's needed to go up or down the 4 steps on my deck or split level--and I could see why, watching her going up and down and seeing her feet slip as she goes. So I've spent a few days poking around at Home Depot and Bed, Bath, & Beyond looking for solutions that are useful but not too drastic or expensive to help. 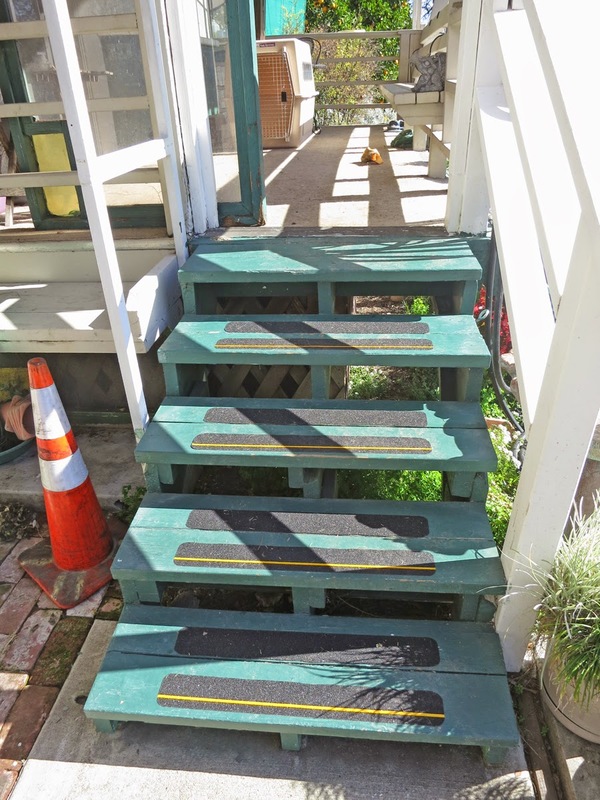 After I installed those, Tika put her foot on the first step, took it off again, and glared at me. Still, she managed to accept the change and to continue to go up and down them on her own. 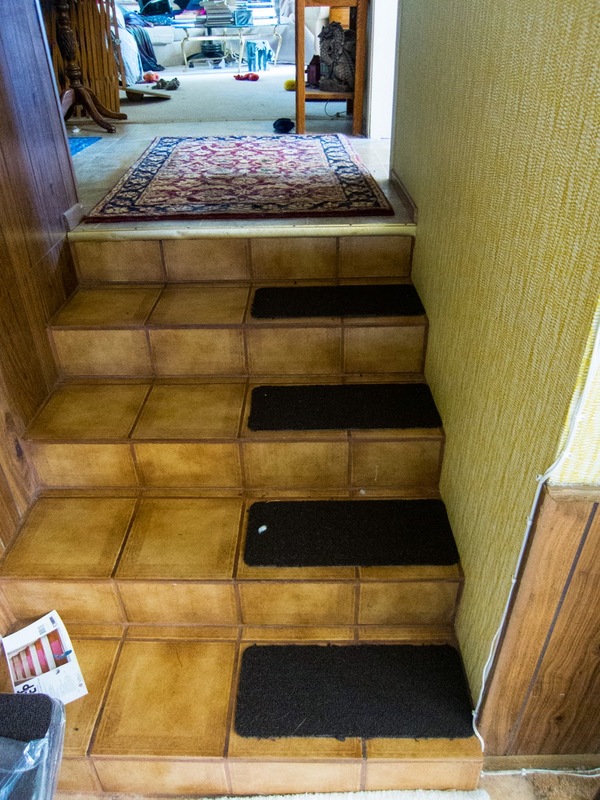 I figured that she needed these carpet mats only on one side of the stairs and I could continue to walk up and down the side with the railing. When she started to go up the carpeted side, she glared at me, veered off to the slippery tiled side, and slipped her way up to the top. Maybe I should've gone with the light-colored one even though the colors and pattern were uggghly. I decided to go ahead and get a 5'x7' gray carpet and some new runners with light rubberized backing to which I added sturdier no-slip backing. She seemed to be OK with that, as the next morning she was sleeping on the gray carpet when I came downstairs, instead of on a bed or the little mats that had been there before. However. I hope that it's not in vain. Her appetite has flagged more and more over the last two weeks. I began to worry when she started refusing her Guard The House Goodie (a Milkbone treat) over the last week. She went from eating nearly 2 cups a day of kibble just 2 weeks ago to eating less and less of anything. I thought that maybe it's because I stopped going for walks (with her or anyone) during February--before that, I'd been walking her slowly for about half an hour about every other day for the previous month and a half or so. We got past the house next door, no sign of sniffing at anything or looking at anything. Then she just abruptly collapsed. Head down. Didn't want to move or raise her head. I knelt next to her and petted her for a while. Wouldn't have been so bad had we not stepped off the curb and been in the middle of the street just around a blind corner. Nice choice, Teeks. I finally convinced her to stand (by hauling up on her harness) and we walked very very very very slowly back across the street and home. She collapsed as soon as she hit the back lawn and didn't move for an hour. Today, she doesn't want to eat anything. Ate two treats that are a tiny bit bigger than Zuke's Minis. And gradually, over an hour, a small jar of Gerber chicken baby food, watered down so that she could lick it up. Won't eat anything else so far that I've offered her. She NEVER turns down treats. Until now. She finally did come into the house, but just barely--I left the downstairs door open into the office, and she walked in just far enough to be on the carpet and lay down there. Hasn't moved since that I can see. I stand (sit/lie) corrected: I just checked, and she did move a couple of feet from where she had originally lain, and was sleeping until I walked through to adjust the door. Her head came up, eyes bright, ears perked. Head down again when it became clear that nothing interesting was happening. She has been on the down side of this roller coaster ride before over the last couple of years, but I think that this is the lowest dip yet. Oh, come on, Teek, pull it together--I just did all this footing stuff for you; you need to take advantage of it! Pleeeze. We're dealing with the same issues with Roxy lately. 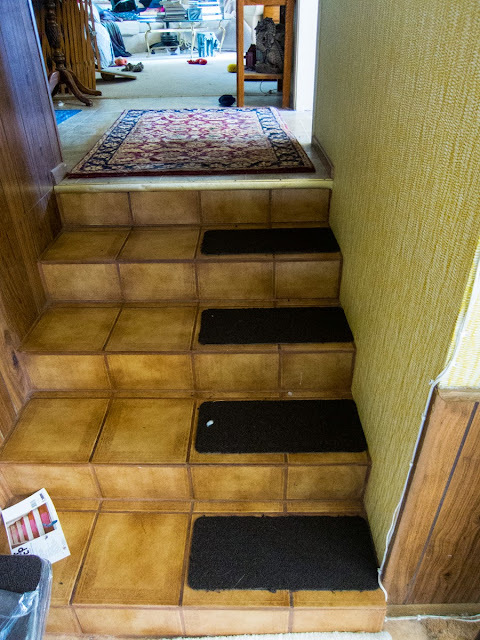 We don't have any stairs in our house except two fairly shallow ones from the kitchen to side yard that Roxx can still navigate, but her back end does sometimes go sideways when she steps up or down into the back patio from the sliding door in our bedroom. Just one step down, but it's steeper, so we help her there now. 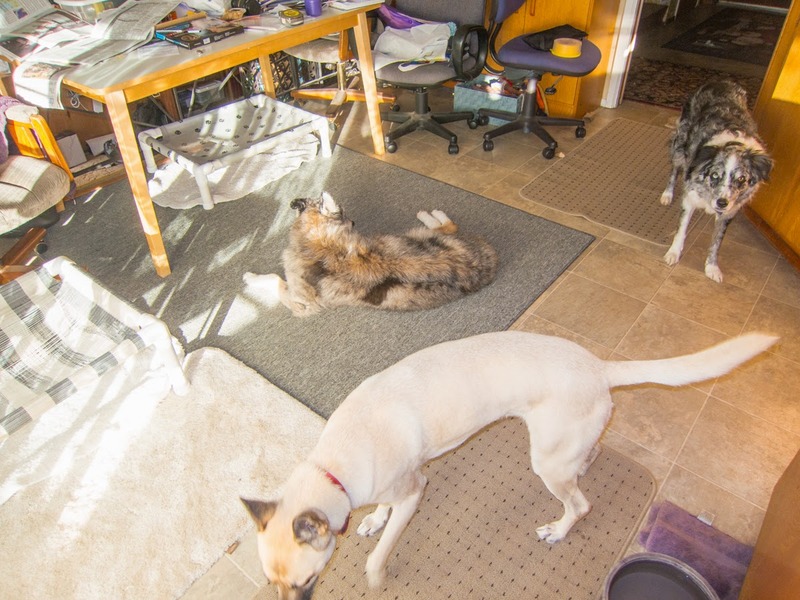 We've put rug runners in the hall, though, and leave blankets and mats around, because she has that same issue--trouble getting her back end under her on a slippery floor. It is a difficult issue for our senior dogs. Hard to see their bodies getting more feeble, but it's a good feeling to solve a problem and make things a bit easier for them again. And I do hope both our old ladies are with us for a while longer. Thanks, and ditto back to you. l must admit that I'm a little scared this time around.